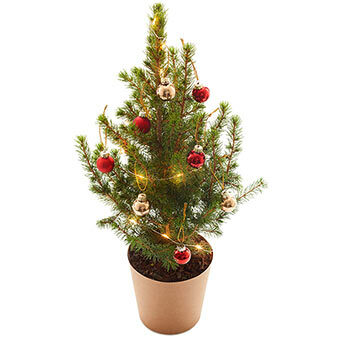 This red and gold little christmas tree has all necessary decorations to give that extra Xmas touch to a desk or small places. Delivered with 1 set of 9 baubles, 1 kraft pot and 1 led garland with batteries included, this Christmas tree is just irresistible. No more excuse, Santa can't miss this lovely place to deliver his gifts!